رهبر, سپیده, شریفی, محمدعلی. (1395). مقایسه روش‌های مختلف تعیین سطح تصحیح ارتفاع ژئودتیک؛ مطالعه موردی شهر تهران. مجله ژئوفیزیک ایران, 10(3), 40-52. سپیده رهبر; محمدعلی شریفی. "مقایسه روش‌های مختلف تعیین سطح تصحیح ارتفاع ژئودتیک؛ مطالعه موردی شهر تهران". 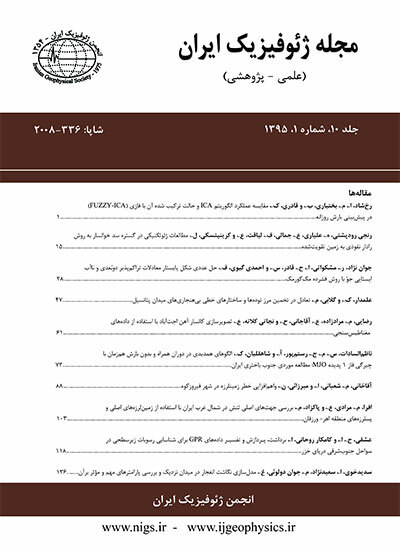 مجله ژئوفیزیک ایران, 10, 3, 1395, 40-52. رهبر, سپیده, شریفی, محمدعلی. (1395). 'مقایسه روش‌های مختلف تعیین سطح تصحیح ارتفاع ژئودتیک؛ مطالعه موردی شهر تهران', مجله ژئوفیزیک ایران, 10(3), pp. 40-52. رهبر, سپیده, شریفی, محمدعلی. مقایسه روش‌های مختلف تعیین سطح تصحیح ارتفاع ژئودتیک؛ مطالعه موردی شهر تهران. مجله ژئوفیزیک ایران, 1395; 10(3): 40-52. در طول دهه‌های گذشته، استفاده از سامانه تعیین موقعیت ماهواره‌ای (GPS) در بسیاری از فعالیت‌های ژئودزی، ژئوفیزیک و نقشه‌برداری توسعه پیدا کرده است. به‌کمک اندازه‌گیری‌های GPS، صرفه‌جویی در زمان، هزینه و نیروی کار حاصل می‌شود. از طرفی ارتفاع بیضوی به دست آمده از GPS، یک ارتفاع هندسی بوده و قادر به تأمین نیازهای کاربردی مهندسی نمی‌باشد و به همین دلیل تبدیل به نوع دیگری از ارتفاع به نام ارتفاع ارتومتریک نیاز است. برای انجام تبدیل بین ارتفاعات بیضوی و ارتفاعات ارتومتریک، سطح تصحیح ارتفاع ژئودتیک تعریف می‌گردد. با توجه به داده‌های دردسترس و همچنین دقت مورد نیاز، دو روش کلی برای انجام تبدیل بین ارتفاعات بیضوی و ارتومتریک وجود دارد که عبارتند از روش گرانی‌سنجی و روش هندسی. در روش گرانی‌سنجی از تلفیق داده‌های زمینی و مدل‌های ژئوپتانسیلی جهانی برای تعیین سطح تصحیح استفاده می‌گردد. در روش هندسی از داده‌های GPS/Leveling در یک سری نقاط بنچ‌مارک استفاده، نوسانات ژئوئید در این نقاط محاسبه و سپس با به‌کارگیری روش‌های درون‌یابی، سطح تصحیح ارتفاع ژئودتیک محاسبه می‌شود. در تحقیق حاضر، از روش هندسی به منظور تعیین سطح تصحیح استفاده شده است. توابع پایه شعاعی یکی از روش‌های مورد استفاده برای درون‌یابی داده‌های پراکنده می‌باشند. این روش شامل کرنل‌های مختلفی بوده که در این تحقیق از کرنل‌های مولتی‌کوادریک و اسپلاین صفحه نازک استفاده گشته است. همچنین شبکه عصبی مصنوعی به‌عنوان روشی دیگر برای تبدیل ارتفاعات بیضوی به ارتفاعات ارتومتریک اعمال شده است. شبکه‌های عصبی نیز شامل انواع مختلفی هستند که با توجه به اینکه شبکه عصبی پرسپترون بیشترین کاربرد را برای درون‌یابی داراست، از این شبکه برای تعیین سطح تصحیح استفاده شده است. درنهایت به‌عنوان مطالعه موردی، داده‌های شهر تهران مورد بررسی قرار گرفته‌اند. از 147 نقطه مبنا که به صورت پراکنده در محدوده شهر تهران توزیع یافته‌اند برای محاسبه نوسانات ژئوئید استفاده شده و سطح تصحیح ارتفاع ژئودتیک در شهر تهران به‌کمک روش‌های ذکر شده محاسبه گشته است. در نهایت مجذور میانگین مربعات (rms) حاصل از روش‌ها با یکدیگر مقایسه شده و روش با کمترین مقدار rms به‌عنوان دقیق‌ترین روش انتخاب شده است. با توجه به نتایح حاصل، اسپلاین صفحه نازک نتایج دقیق‌تری را برای داده‌های شهر تهران ارائه داده است. During the last decades, GPS has been used in many applications of geodesy, geophysics and surveying. The ellipsoidal height which is provided by GPS is a geometric height and lacks a physical meaning. So it cannot be used in most of engineering applications. Therefore, we need another type of height known as orthometric height which is one of the physical heights. The main advantage of leveling is its high accuracy but on the other hand, leveling measurements involve large amounts of time, cost and labor work. So another way to reach orthometric heights from GPS measurements is to determine geodetic height correcting surface of the area. Depending on the data availability and accuracy requirements, there are two basic approaches to transform the ellipsoidal heights to orthometric heights which include the gravimetric approach and geometric approach. The gravimetric approach uses the gravity data to determine the correcting surface. The geometric approach is to use the GPS/leveling data and interpolation methods in order to determine the correcting surface. In the present research, the geometric approach is applied to determine the geodetic height correcting surface from GPS/Leveling data. To do so, some reference points with known ellipsoidal and orthometric heights are used. Since there is a linear relation between the triplet of ellipsoidal, orthometric and geoid heights, one can calculate the geoid undulation by means of that relation and finally calculate the geoid undulation in every point of the area by the use of interpolation methods. First, basic definitions and equations of the radial basis function are explained. The method of radial basis functions is a global interpolation method used for interpolation of scattered data. This method was developed by Richard L. Hardy. Different kernels can be used as the kernel of radial basis function like multiquadric, Gaussian, thin plate spline and linear. In this paper, multiquadric and thin plate spline kernels are used to determine the correcting surface. The multiquadric method contains a parameter called shape parameter which is defined by the user and in actual applications, it affects the accuracy of the method. There are different ways to determine the shape parameter, among which the cross-validation procedure is explained. Then, the artificial neural network is defined as the other method to determine the correcting surface. Neural networks have different types but the multilayer perceptron neural network is the method commonly used in interpolation applications. Therefore, in this research, a three-layer perceptron neural network is used. Finally, as the case study, the GPS/leveling data of Tehran is analyzed. The ellipsoidal heights and orthometric heights of 147 benchmark points distributed all over the area are used in order to calculate the geoid undulations. And then the geodetic height correcting surface is determined using the multiquadric and thin plate spline and the artificial neural network methods. At last, their root-mean-square (RMS) values are compared with each other and the method with the lowest RMS is chosen as the most accurate method. The results show that the thin plate spline method leads to better results in Tehran. خضرائی، س .م، نفیسی، و.، منجمی، س. ا. ح.، عسگری، ج.، و امیری سیمکویی، ع.، 1393، مدلسازی ژئوئید محلی دقیق با استفاده از داده‌های GPS، ترازیابی و تکنیک‌های هوش مصنوعی (مطالعه موردی شاهین‌شهر اصفهان): مجله علوم و فنون نقشه‌برداری، دوره چهارم، شماره 3. میرصالحی، م. و تقی‌زاده کاخکی، ح.، 1387، شبکه‌های عصبی: انتشارات دانشگاه فردوسی مشهد. Cakir, L., 2011, Modified quadratic shepard and radial basis functions interpolations for determination of orthometric heights from global positioning system (GPS) heights: International J. Physical Sciences, 6(36), 8183–8187. Donato1, G., and Belongie, S., 2002, Approximate thin plate spline mappings: Springer Verlag Berlin Heidelberg, Vol. 2352, 21–31. Gullu, M., Yilmaz, M., and Yilmaz, I., 2011, Application of back propagation artificial neural network for modeling local GPS/Leveling geoid undulations: A comparative study: FIG Working Week, Bridging the Gap between Cultures. Hatam, Y., Bayer, R., Vanicek, P., Bonvalot, S., Daignieres, M., Diament, M., Djamour, Y., Panet, L., and Verdun, J., high resolution geoid model of Iran software. Lin, L. S., 2009, Application of neural network and least squares collocation to GPS height transformation: Asian Association on Remote Sensing, ACSR 2009, Beijing. Oudman, E., 2006, The Transformation of GPS into NAP Heights Combining NAP, GPS and Geoid Height to Compute a Height Reference Surface for the Netherlands: M. Sc. Thesis, Delft University of Technology. Raizner, C., 2008, A Regional Analysis of GNSS-Leveling: M. Sc Thesis, Stuttgart University. Sharifi, M. A., 2006, Satellite to Satellite Tracking in the Space-wise Approach, Ph. D. Thesis, Stuttgart University. Veronez, M. R., Thum, A. B., and Souza, G. C., 2006, A new method for obtaining geoidal ndulations through artificial neural networks: 7th International Symposium on Spatial Accuracy Assessment in Natural Resources and Environmental Sciences.